ICS endeavors to partner with parents in their role to instruct their children in the way they should go (Proverbs 22:6). 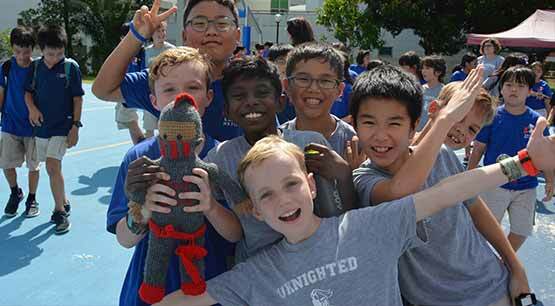 In this partnership, ICS commits to providing a dynamic, challenging, and holistic education that recognizes the personal uniqueness of each student and develops them into the person they were created to be. To reach one's God-given potential, there must be an inner transformation that takes place. When that happens, boys and girls, young men and women are not only transformed, but they begin to impact the world around them. Nothing gives us more pleasure and fulfillment than when God receives glory in and through students' lives. Read more in our Statement of Faith. ICS is committed to Christ-centered education. We are a school that puts Christ at the center of all academics and activities. We strive to reach our students with the love of Jesus Christ and nurture in them Christ-like character and love for God. This Christ-centered focus forms the foundation of our family/community environment. ICS is a place where students and families are welcomed and known. No student is merely a name on a class list. Our teachers and staff strive to educate and reach each and every child on a daily basis. We want to know our students, make them feel a part of the family, and give them a safe place to belong. This spills over to the families of our students and beyond so that our mission of impacting the world for the glory of God is ultimately realized. These four core values are the bedrock of our school and how we operate. ICS is a Christian school founded upon the belief that God is the source of all truth, and true education is based on His revealed word, the Bible. We are dedicated to establishing a godly environment in which the Bible is actively integrated into all aspects of school life. We strive to encourage students to imitate Christ through a variety of avenues: studying the Bible, age-level chapel services, spiritual emphasis programs, and service trips throughout Asia. We are family. When students join our school, they join the ICS family. Our international atmosphere is an open door for students of all cultures, races, and nationalities. We proactively work to build relationships among students and between students and teachers that go beyond the classrooms and grade levels. Our goal is to help our students to learn to respectfully interact across age, cultural, and ethnic boundaries. We also strive to reach out to our students by creating opportunities for each family member to participate in school functions. We believe that education is characterized by a dynamic, challenging curriculum coupled with a high expectation for student achievement. We view education holistically. Education includes far more than learning to pass a test. We create opportunities for our students to apply what they have learned while maintaining a focus on in-depth proficiency in all subject matters. Our goal is to instill a love for life-long learning. We believe every person should always pursue excellence. Pursuing excellence means that one is working towards being outstanding. Excellence has a place in the academic world, the professional arena, and our personal lives as well. We encourage all members of our community to strive toward excellence in whatever they do. We want our students to try their best in their academics, collaborate with their peers, and work to improve the ICS community and their world. ICS employs teachers who strive for excellence in their professional lives and find ways to improve student learning in the classroom. Teachers who seek professional development will provide their students with the best educational experience possible. Students will be challenged to develop and pursue personal excellence in their own lives, striving to follow and fulfill their God-given potential. We focus on building these interpersonal, curricular, and spiritual characteristics within each of our students.